Happy Monday, beautiful people! Today I wanted to show you how to solve your "nothing to wear" dilemma AND snuggle up with your sweetie's wardrobe just in time for Valentine's Day. 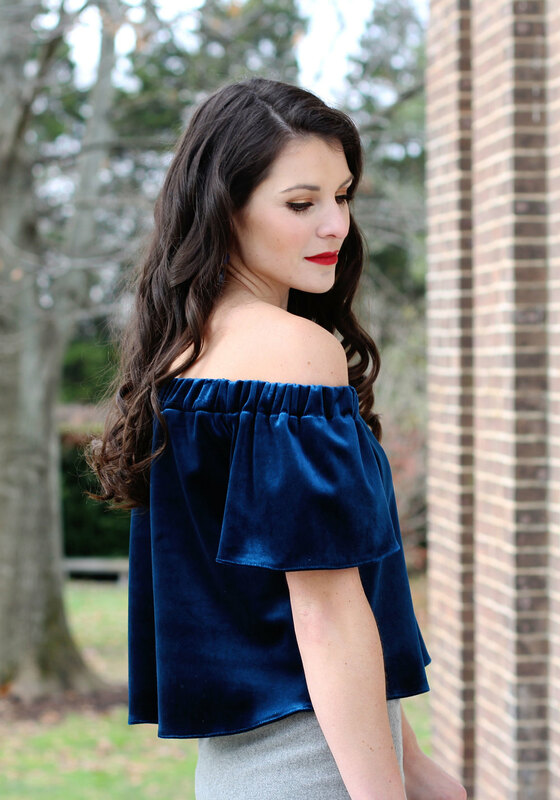 I'll be honest, I haven't worn velvet since my 4th grade orchestra concert but when I saw this Topshop Bardot top, I had to have it. The blue jewel tone is absolutely gorgeous and it's perfect for the holidays! When I was deciding what to wear with this top, I thought it would be fun to pair it with a pencil skirt so that you can incorporate something from your work wardrobe! Another option would be to pair this top with a black plaid pixie pant or wide leg wool pant. Although this off the shoulder top might not be appropriate for the office, all you have to do is change tops after work and you're party ready! The Topshop version might be sold out by the time you read this post, but I have linked similar versions below (and a cozy sweater variation too)! Thank you so much for stopping by Me & Mr. Jones, have a wonderful weekend! This MINKPINK "Rum Diary" maxi dress turned out to be the perfect outfit for a casual night out in California! It is so comfortable and the lace is beautiful. Luckily, the length was just right for my new favorite sandals from Nordstrom Rack (also here). The rum drinks were pretty good too! Mr. Jones and I take a trip to California every year and this year, we got to spend time in Laguna Beach. Skyler's aunt and uncle had us over for dinner and we got to enjoy each others company as the sun set. Everything about this evening was beautiful and I miss our California family already. It's finally starting to feel like summer and I couldn't be happier. 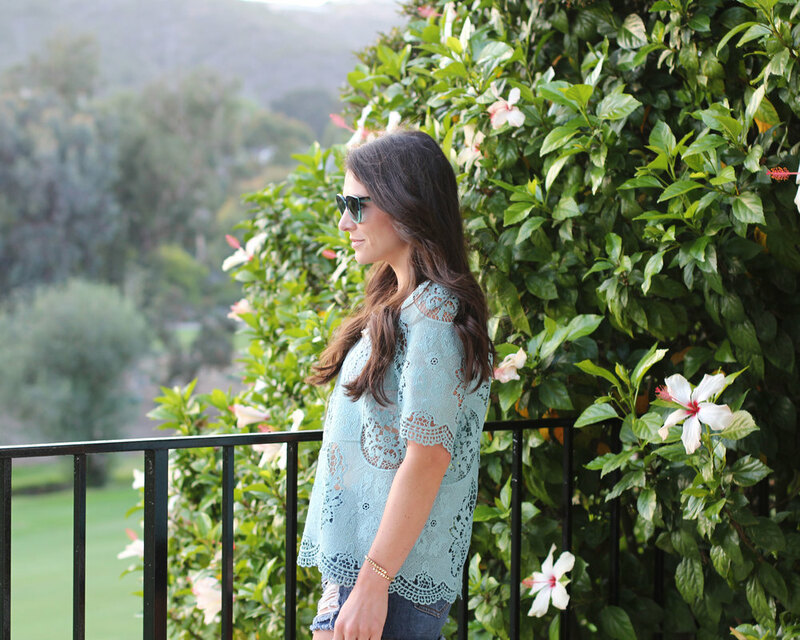 My favorite tops for warm weather are usually Free People; they always carry lightweight, flowy, and effortless tanks like this one from Nordstrom Rack. I also can't get enough of Sally Hansen's Insta-Dri nail polish! It dries so fast and comes in so many shades. The one I'm wearing today is called "Set Sail" and is perfect for summer! This outfit is essentially a list of my favorite items. I wear this jacket constantly because it's comfortable, flattering, and lightweight, making it perfect to wear on those chilly spring mornings. I found a very similar jacket that is SO PERFECT for summer! I want it oh-so-bad, but I realize having two of almost the same jacket is a little silly (or is it?)! The Einstein mural is in Lexington's distillery district and one of my favorite murals ever. The artist is a creative genius if you ask me!